Every Staffy or Pitbull handler dream his dog to be a defensive rock. To achieve the best result in dog's education the dogs are required to pass out a course of complete training. 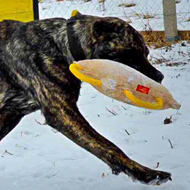 Professional dog trainer and reliable dog training equipment make wonders. 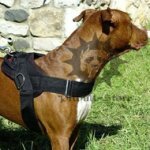 There is a widest choice of dog gear at the dog products market, but how to choose the best equipment for your Staffy? 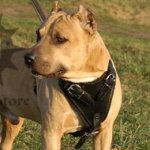 Our company specializes in production and sale of purpose-designed dog training equipment for such sporting dogs as Amstaff, Pitbull, Staffy, Bull Terrier and similar breeds. 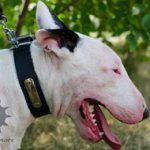 We have a strong customer base of dog trainers, breeders and handlers which use our dog supplies for professional training, sporting contests and world championships. We have only the best client testimonials and a lot of photos with the dogs which became champions in our dog gear. 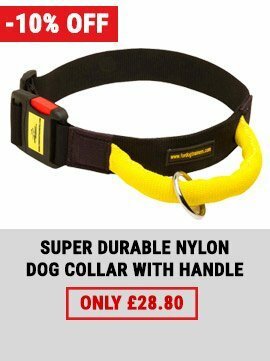 Some of our dog training products are real bestsellers for their premium quality and functionality. We hope, that our list of the most popular dog products will help to choose the most suitable items for training your powerful dog. 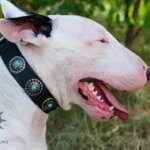 This leather agitation dog collar with handle is of ultra-high-strength and convenience, it's intended for reliable control during dog training, working, exercising and sports activities. Perfect for K9 and police dogs. Ideal for attack, protection and agitation work. 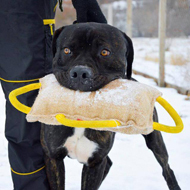 You can always keep a tight reign on your powerful Staffy with the helping of strong and practical handle. Double-layered natural leather, protection plate to save the dog's coat, smooth inner surface, reliable stitching and solid metal fittings create a superb combination of durability, quality and design. 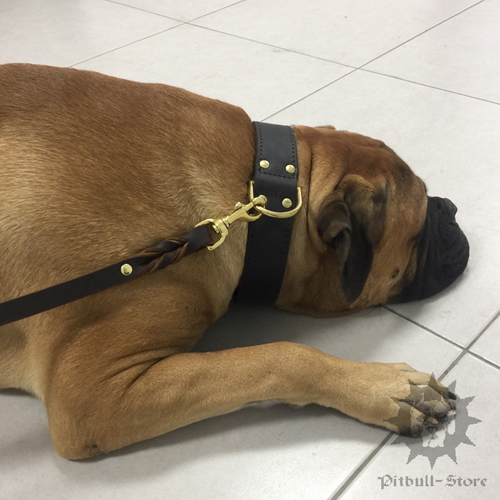 Correct and control every movement of your Staffy with the helping of this super strong and convenient leather dog leash with comfy handle. The dog leash doesn't tear even at heavy loads, that's why it's so popular and all-liked by our dog trainers and handlers. 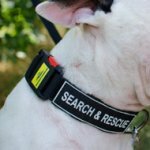 Every detail in our dog leash is high-quality and extremely durable, that means the lead will serve your Staffy for a long time. 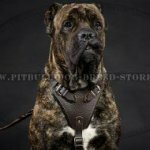 We also take care of decorative appearance of every dog accessory in our dog store and we added braided elements to this dog lead to make it elegant. 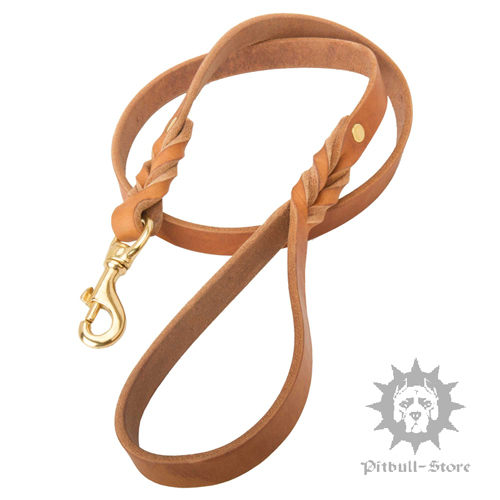 Style and functionality in one leather dog leash! 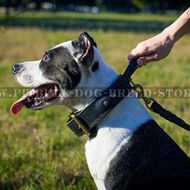 Dog training and sports of such active dogs like Staffy or Pitbull always mean a wide variety of physical exercises. 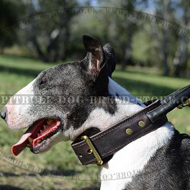 Not every dog lead will suit for outdoor exercising, that's why our experts did their best and designed multi-purpose dog leash that will replace using of two or more leashes for different types of dog sports. 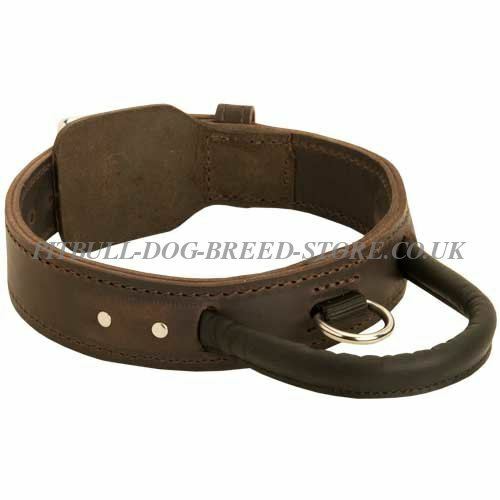 The main advantage of this leather lead is its adjustability. What does it mean? 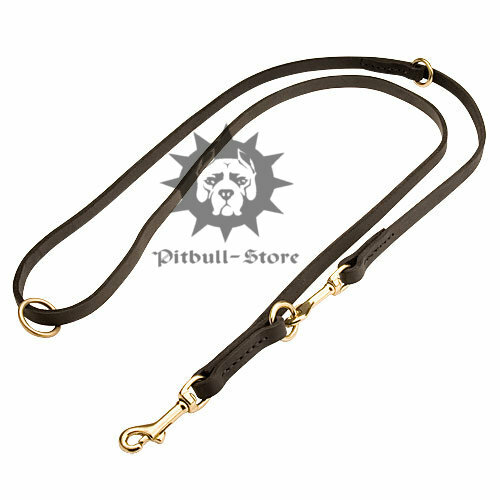 This means that you can regulate the length of the leash according to your needs. There are two quick-detachable snap hooks and three welded O-rings, which will help you to adjust the lead and change its functionality. 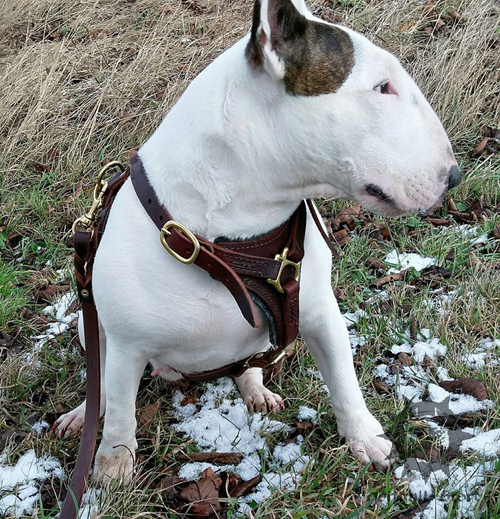 You can use the dog leash with its classical length, but if you fasten a snap hook to the loose ring, you get a medium length of the leash and train the dog. Fasten a snap hook to the third ring and wear the lead over the shoulder. You can also walk two dogs by attaching the snap hooks to the dog collars. 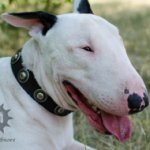 Walk and train your Staffy using only one dog lead. 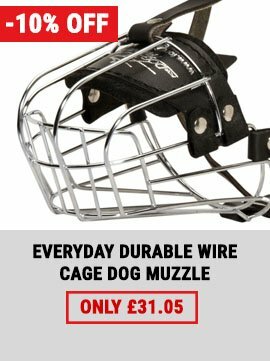 This is really great wire dog muzzle for grown-up Staffy or Pitbull. 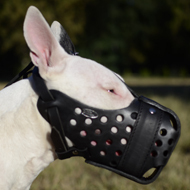 The muzzle is covered with non-toxic rubber to protect the dog's nose from sticking to the muzzle in frosty weather. 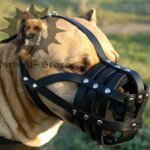 Not every dog muzzle has such an advantage. 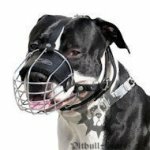 Now you needn't change the dog muzzle depending on the weather. 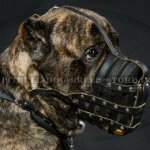 Rubber covering protects also the muzzle from corrosion. The muzzle looks heavy and rough, but it's not so. 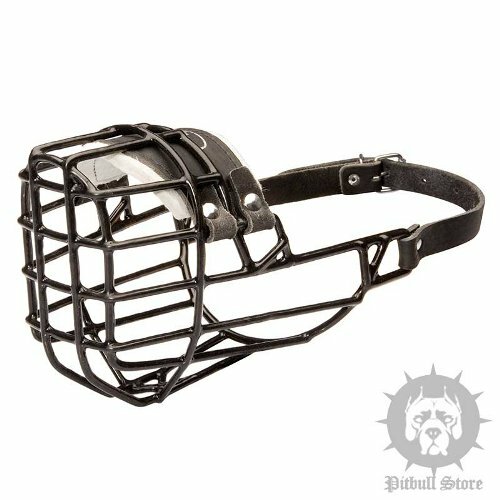 Lightweight and soft felt lining on the nose area make the muzzle comfortable for long-term wearing. 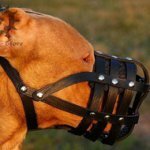 Your Staffy will feel no pain or discomfort being muzzled. Perfect airflow and extreme durability. 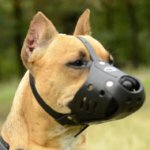 This wire dog muzzle also allows the dog to drink water and to open its mouth. Maximum convenience, reliability and freedom are what your Staffy and you need. 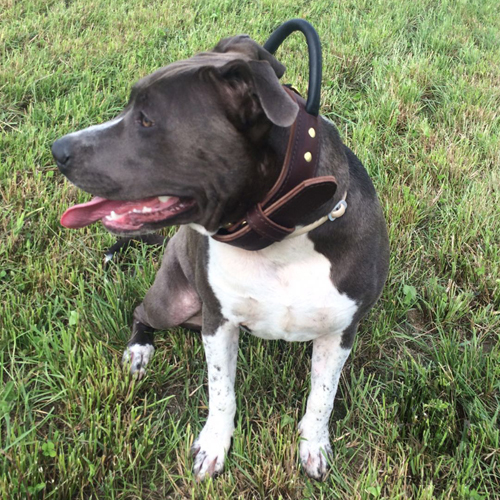 Working dog muzzle of thick leather is perfect for draft dogs. 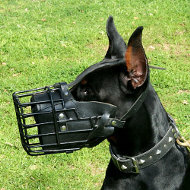 The muzzle fixes the dog's jaws and provide complete safety for people around. 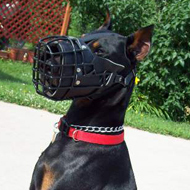 This closed dog muzzle is widely used by cynologists for police and K9 dog training. 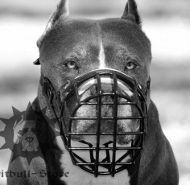 It protects from dog bites, doesn't rub the dog's muzzle and allows the dog to breathe free due to air inlets. Your Staffy won't be traumatized during attack or protection training. 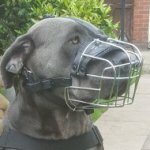 The muzzle is also used for safe dog walking. 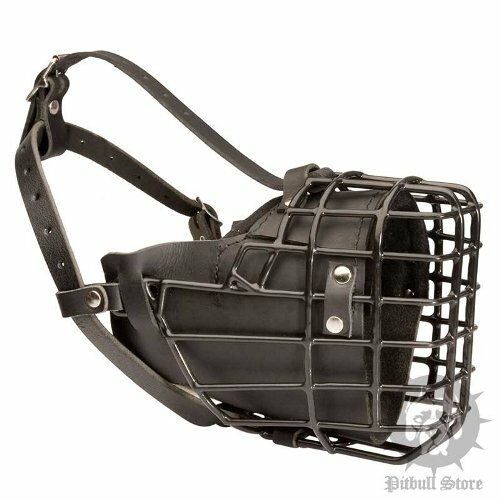 This wire dog muzzle is intended for dogs working for special police, guard and military services. 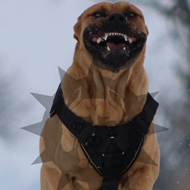 Our experts designed this muzzle together with police K9 units to make the best muzzle for working dogs. 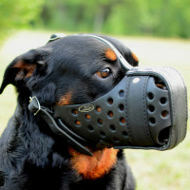 s a result, the muzzle is incredibly strong, reliable and maximum comfortable for the dog. 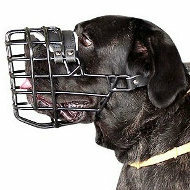 The dog can wear this wire muzzle for a long time without feeling any discomfort. It's a very important point for successful dog working. 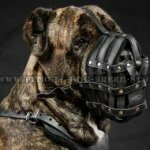 Special muzzle construction allows the dog to open its mouth and breathe in a free way. 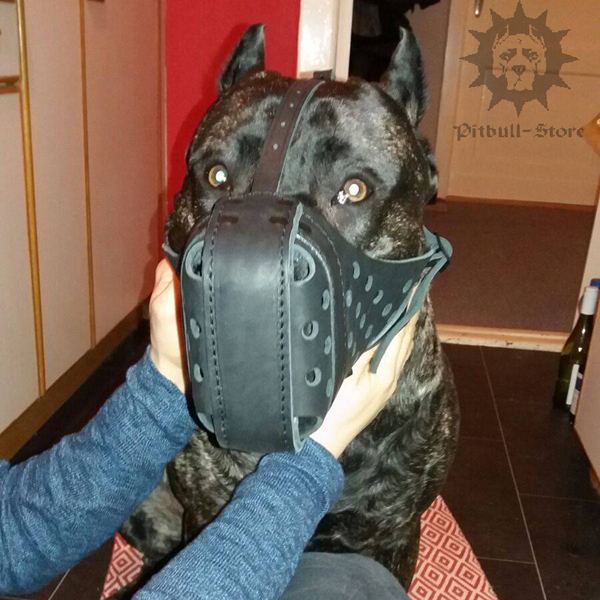 Black rubber covering makes the muzzle to be suitable for frosty weather. 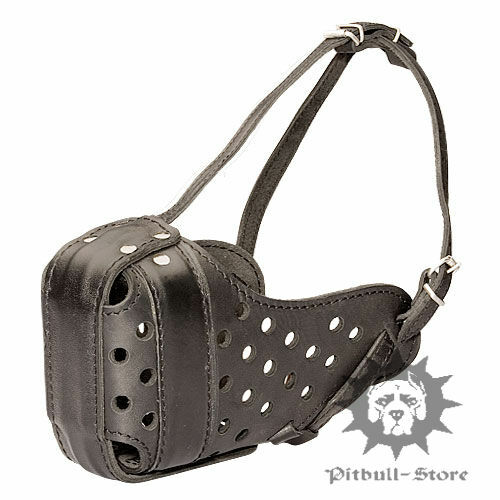 Leather padding protects the dog's nose from rubbing. It's an unchallenged leader for draft dogs. 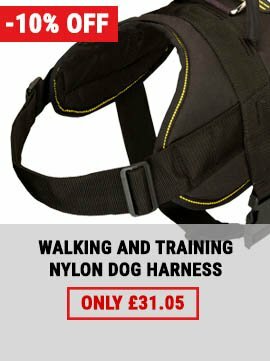 This nylon dog harness is rightfully considered to be the most functional and convenient outfit for a variety of dog activities from daily walking to professional training and working. 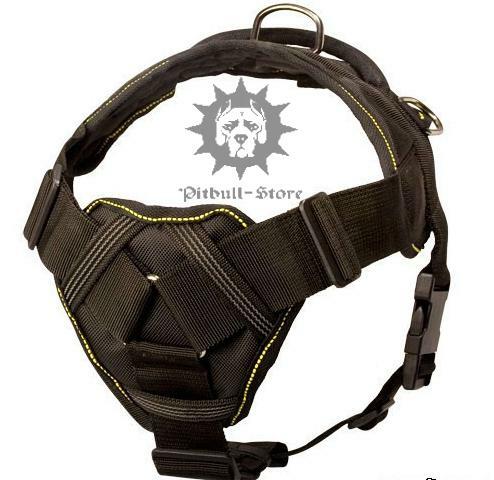 It's a real finding for those, who are looking for universal dog harness. 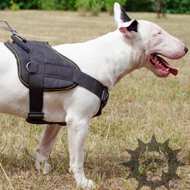 Super light weight, heavy padded wide breast and back plates, control handle, 4 ways of adjustment, quick-release buckle, upper ring for leash walking and side rings for pulling work. 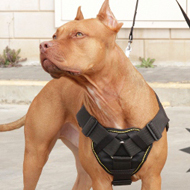 Such a multifunctional harness will help you to mix-up dog activities and to keep up a regular training. 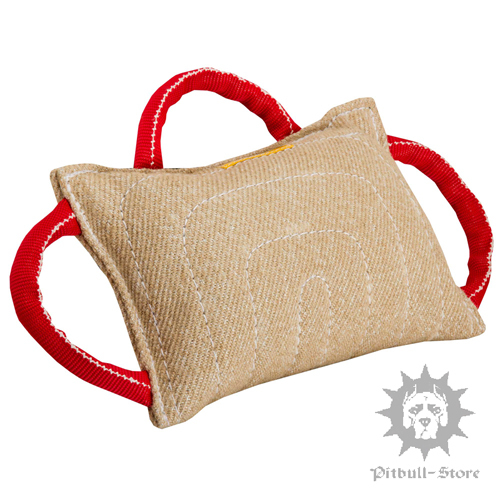 Start your Staffy training with this jute bite pillow that will help to build full mouth grip of the dog and develop dog bite skills. 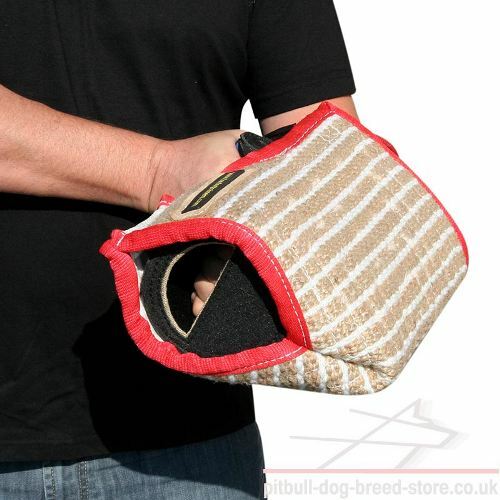 The dog bite pad is made of strong natural material and reliably stitched to resist bites of your young but powerful dog. 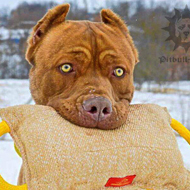 Non-toxic heavy stuffing makes the bite pillow soft and safe for the dog's teeth. 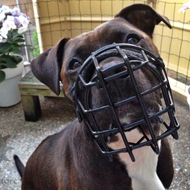 Three firm and convenient handles allow to hold the item reliably and to vary Staffy bite training. 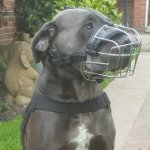 Absolutely safe and very effective bite pad for basic dog training. 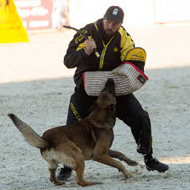 Professional attack and protection training is performed with bite sleeves only. 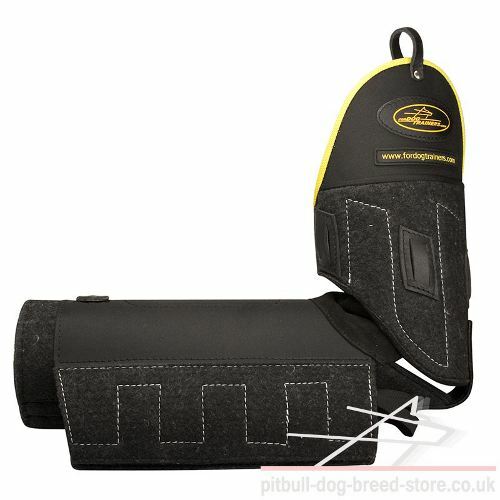 This attack dog training sleeve is a revolutionary gear to protect the dog trainer from hard bites of your Staffy and to impove its bite skills at advanced training level. The highest safety and comfort rate. 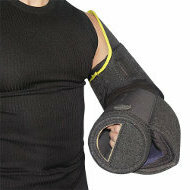 Full arm and shoulder protection. Maneuvering advantage. 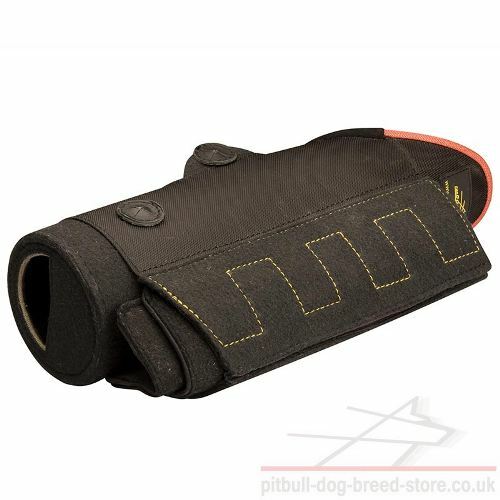 Experienced trainers use this bite sleeve to prepare dogs for professional competitions and to take part in world championships. 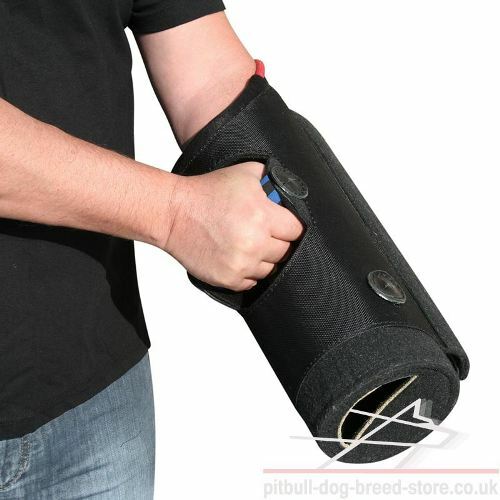 This bite sleeve will help you to train your Staffy or Pitbull to professional sports competitions like IPO or Schutzhund. 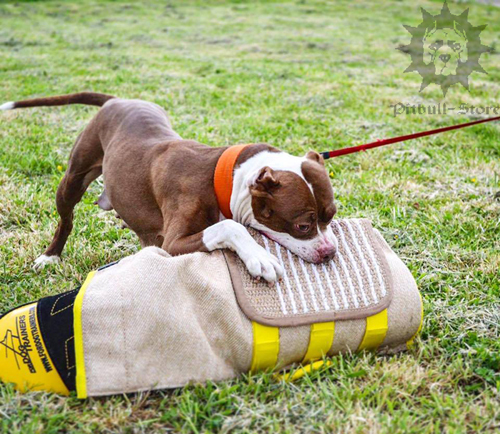 The sleeve is also used for police, K9 and military dogs training. It's distinct in its light weight, perfect bite area angle, supreme level of comfort and durability, flexibility regulation. 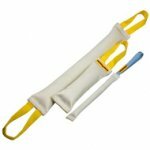 Dog trainers recommend to use this bite sleeve for young and older dogs training. 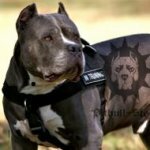 You can find all these professional dog supplies in our Pitbull Store. You can always contact us via e-mail: info@pitbull-dog-breed-store.co.uk or find us on Facebook. 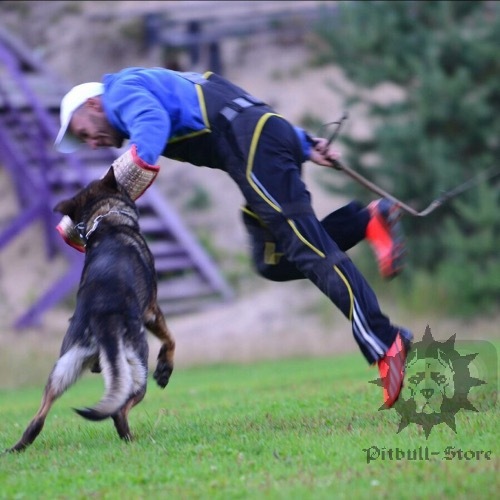 We will be pleased to help you in choosing the best dog training equipment for your champion. We have great discounts for dog schools and individual dog trainers. We are open for partnership, just apply to us!